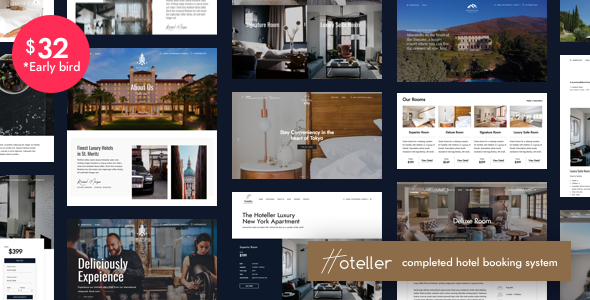 Hoteller WordPress Theme is a responsive WordPress theme created especially for hotel, resort and apartment with completed booking system within theme package. Built with the latest WordPress technology. 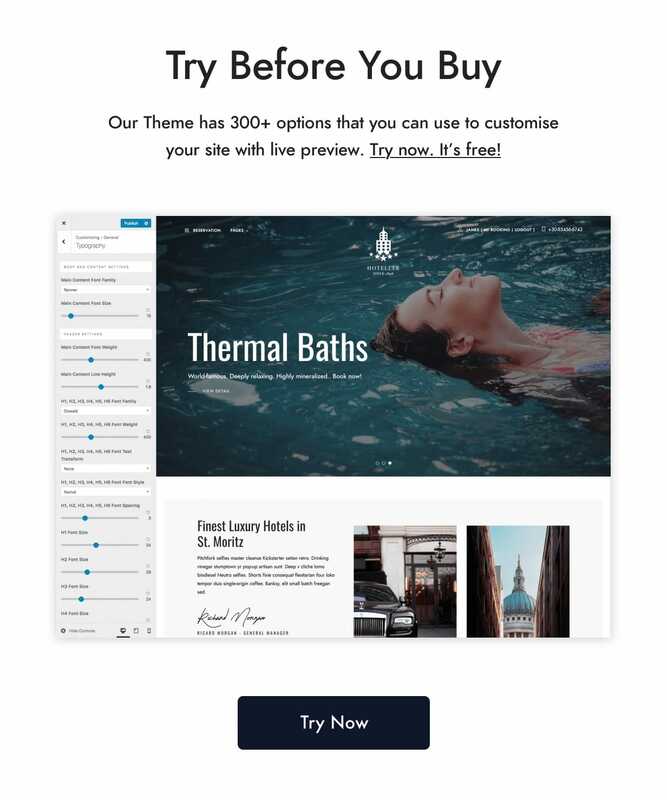 Hoteller support responsive layouts built especially for hotel, resort or apartment website so it looks great on all devices. It has hotel booking management features such as seasonal pricing, booking management, flexible rates and many more. 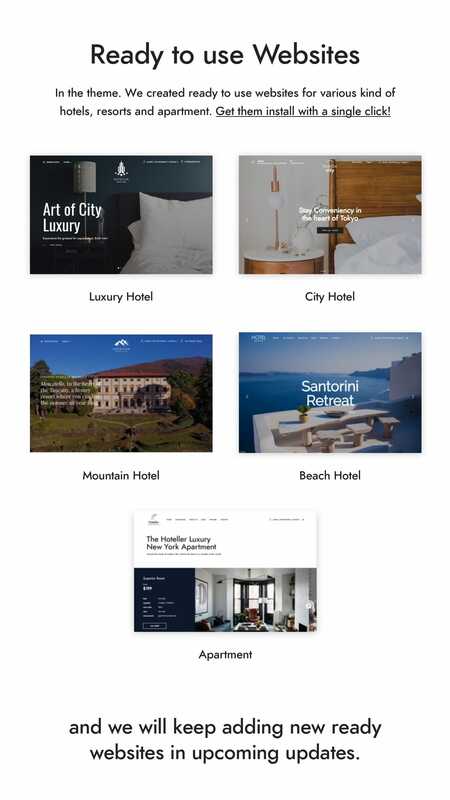 Including various ready to use websites for different kinds of hotel for example luxury hotel, beach hotel, mountain hotel, city hotel and apartment etc. which can be imported with one click. With our advanced booking management. Your customers can search availability then complete booking form and complete payment directly from your website.. Single Accommodation Page with room detail, price, gallery and booking form. Search Availability Results based on number of adults and children. Checkout page. Your customers enter their personal informations and make payment. Your customers can login with their account and check booking history. Seasonal Pricing Set any prices depending on a season or specific days / dates. “Season” is a general term and you can label it anyhow to reflect your pricing changes. Flexible Rates Set different rates based on the accommodation benefits (e.g. breakfast included / no breakfast). Your guests will choose the most suitable one while placing a booking. Variable Pricing Make the prices change dynamically depending on the search parameters of your guests. Customize accommodation rates by setting price variables based on a number of guests. Weekly and Monthly Rates You can set any property rate depending on a season (any term). To create different price points based on the length of stay, you can add weekly, monthly or other customizable rates. Booking Multiple Accommodations The search algorithm is very smart, so your guests will get the most suitable results in seconds. However, the guest can skip the recommendation and make their own choice. Packages and Services Offer bookable extra services or packages (free or paid) along with the accommodation reservation. Charge per room or per person. Set min / max days to stay and available check-in and check-out dates for the entire hotel establishment, accommodations individually or seasons. You may also disable booking option for all accommodations or any one individually for a certain period of time. The booking system accepts payments through PayPal, 2Checkout, Stripe and Beanstream/Bambora (these are built-in payment gateways you can use for free). Charge the full fee or deposit to confirm the booking, allow guests to pay after arrival. Complete and correct pricing information on all accommodation charges: add mandatory fees, accommodation taxes, service taxes and fee taxes. The guests will be able to see the summary of charges before making a booking. All this info on each booking is stored in the admin dashboard as well. Automatic synchronization of bookings submitted through your WordPress property rental website with those from online travel agents like Airbnb or Booking.com. Avoid overbooking! All received bookings and booking requests in their current statuses are stored at one place, easily sorted and displayed in a calendar view. You’ll be able to set a discount amount, an expiration date, select accommodation types, set check-in and check-out dates, minimum and maximum days to stay and apply other settings to customize your coupons. You can create multilingual website for your hotel easily using Free Polylang plugin. See example demo below. Your guests will find the checkbox for opt-in consent below each booking form to accept your website terms and conditions before reservation. Save as Template Page can be saved as template in order to apply to new pages. This saves time to develop new pages. Polylang and WPML Plugin Compatibility, allowing you to translate your site to any language or multiple languages. This entry was posted in Wordpress Themes and tagged accommodation, apartment, bed and breakfast, bnb, booking, depositfiles.com, download free, download rar, download theme.rar, download theme.zip, download wordpress theme, download zip, free, free wordpress theme, get rar, get zip, holiday, hostel, hotel, hotel booking, hotel WordPress Theme, hotelier, Index Of, mirrorcreator.com, motel, nowdownload.ch, nulled, nulled theme, Parent Directory, rar, reservation, resort, travel, ul.to, zip, zippyshare.com by wordpress. Bookmark the permalink.